The initial plan was to pop into Royale for a Friday lunch burger, and perhaps a beer. Good memories of juicy burgers and Pulp Fiction associations were enticing. 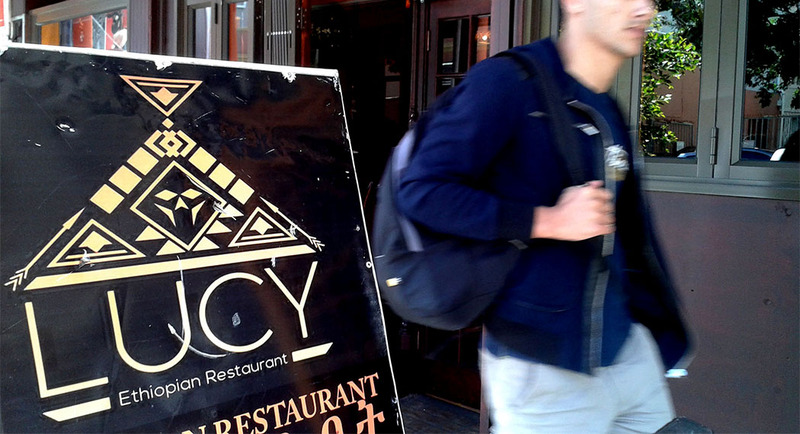 But walking down from the top of Long Street, Lucy caught our eye, and a sense of adventure replaced nostalgia. We decided to go forward, particularly as we both strongly disagree with Musi Maimane’s anti-immigrant stance as part of the DA manifesto. We need Africa, especially considering one of the things African immigrants – whether they be refugees or asylum seekers – has brought us, is a wealth of cuisine and custom. So Ethiopian it was. We were keen to have more of that spice, and dabbing it into our mouths folded between the soft nutritious injera (a type of soft flatbread) it is served on. The light north-westerly that had seen us leaving the house in jeans and closed shoes, had dropped and the city bowl was beginning to bake. Lucy’s was dark inside, appeared cool. Also, recalling a favourite spot in Maboneng and experiences of great value for money, we also liked the thought of double, rather than triple, digits on the menu. That was an illusion soon dispelled when we received them. It is a narrow shop with booths down one wall and a staircase going up the other side, to what is a larger, light-filled floor, which remains unused unless demand requires it (the kitchen is downstairs, you see). A lot of care has been put into the décor; the wallpaper is as intricate as the cover of Santana’s Abraxas album, and the cushions covered with genuine East African cloth. It is not cheap, but the menu is expansive and the service almost impeccable. We took a middle booth as its inhabitants were leaving, and found ourselves surrounded back and front by Americans. The large flat round basked with a washed glass plate inside also gave it away. Lucy caters to the tourist market. Our attentive waiter, Richmond, explained everything to us, more as if this was an event beyond that of sitting down to lunch. It was partly our fault, we asked him to explain the menu at the beginning, which led to an explaining of how the food is eaten (with your hands, which you use to break off some bread and pick up a pinch of, for instance, chickpeas stewed in onions and turmeric), and how hands are washed, and coffee taken. We forbore it with good humour, as tourists would, and took the opportunity to egg him on by asking questions such as what was in the water with which we were washing our hands? Nothing, apparently. The food wasn’t great. Certainly not as mouthwatering as we know these dishes can be. Perhaps the spices were toned down for a tourist palate. In hindsight I should have just gone for the Doro Tibs, which is chicken cubed and stir fried with onion and the delicious berbere spices. Instead, we spread our options by choosing the platter for one, which is a mix of five dishes, all of them vegetarian if you choose, and a combo, which is a choice of two chosen dishes off the menu. The idea was to share all seven of them. Which we did. The Defin Misir Alicha – lentils with onion, turmeric, ginger and garlic – was uninspiring, but we mopped up the mildly spicy Misir Wot – red lentils with onion, berbere, garlic and ginger – with relish. The Yegbeg Alicah – lamb sauteed and slow cooked with onion, garlic, ginger and tumeric with a touch of kibe (clarified butter) – was also good. Misir Wot won on the vegetarian front, and Kek Alicha of yellow split chickpeas was also worthwhile. In the kitchen’s defence, food is enjoyed most when in a lightly celebratory mood, which we weren’t. We’d been reading about, and discussing climate change of late, and had things to deal with. Despite the hefty bill, the outlook seemed a bit brighter when we left. Perhaps it was the kick in the highlands coffee, but Lucy did something right.